At Poker Hill School we view learning developmentally. It is a process which we can nurture and guide but we trust each child to develop in his or her own unique way. We support each child’s growth as an autonomous individual within a caring and democratic community. We strive to make each child feel respected and valued. Teachers facilitate children’s growth by encouraging the children to make significant decisions to direct their own path of learning. Children select their own chores, have large blocks of free play, and choose their own activities for morning activity time. The teachers also attempt to reflect the children’s interests and needs in both our large group and small group planning. We offer a full day program for 3-5 year old children. Children turing 3 by September 1st attend the Tuesday/Thursday program and children turing 4 by September 1st attend the Monday/Wednesday/Friday program. The core program runs from 8:30 a.m. to 3:30 p.m. with before school care available from 7:30-8:30 a.m. and after school care from 3:30-4:30 p.m. The typical child to staff ratio is 6-8 children per teacher. Our staff has a tremendous amount of early childhood education experience. Poker Hill School can be nut-free if needed. Food allergies can be accommodated. For more information about preparing and packing peanut-free and tree nut-free lunches and snacks, please visit: http://www.foodallergy.org/. *Call 899-3716 or email [email protected] to set up a time to visit PHS and learn about our preschool program, meet the teachers and get a sense of our day. We encourage you to bring your child/ren! *If at your visit you feel PHS is a good fit for your child and family and you are interested in completing the application, you will be given a brief application form. This, along with the non-refundable $50 application fee, will place your child on the list for the school year they are eligible for. The application and fee may be returned at the time of the visit, mailed in or dropped off at the school another day. *Please keep us updated of any changes in contact information. *Feel free to email or call with any questions. *Our school year starts in September and runs through mid-June. *Enrollment is determined early in the year, typically Jan-early March. You can expect a call at this time. families on the waitlist. This means that it is sometimes helpful to visit late fall/early winter the year before your child would be enrolled to ensure you are confident in making this decision. It is often helpful to ensure both parents have visited so you feel prepared to make a prompt decision when a spot is offered to you. The guaranteed enrollment of the siblings of current Poker Hill School students & alumni children has always been and continues to be a goal & priority for PHS. However, there are years when the number of returning students and/or siblings exceeds expectations and in these circumstances in order to keep our numbers down and maintain the high quality of our programming, we may need to turn students away. With sibling enrollment so unpredictable from year to year and more & more children of alumni applying to PHS every year, we felt it was necessary to make our enrollment process & policies clear. -An application needs to be submitted for all siblings and alumni. -The deadline for submitting an application for all applicants, including siblings and alumni, is September 30, one year prior to enrollment. -PHS will notify families within the month of December on their enrollment status. -Enrollment/registration forms will be sent the following March. -Families planning on attending PHS must submit enrollment forms and a 10% deposit due May 10. 1. Students who are children of Poker Hill School staff. 3. Students with currently enrolled siblings. 4. Children who are sibling alumni. 5. Children of a parent who attended Poker Hill School. 6. Students who are new to the school with no staff, sibling, or alumni relationship. *If you are interested in your child attending Poker Hill School it is never too early to apply. *If you do not live close by, but are planning to move to the area, please contact us to learn more about our program even if you are unable to visit for a while. *Once you have been offered and accept a spot at PHS, you will be sent mailings throughout the spring and summer in preparation for the school year. Tuesday/Thursday (2 days): Annual Tuition is $4,580. Tuition is due by the 10th of each month. When you accept a spot, a non-refundable deposit in the amount of 10% of the annual tuition (above) is required. Tuition covers 8:30 a.m. - 3:30 p.m.
Before and After School Care is available for 7:30 - 8:30 a.m. and 3:30 - 4:30 p.m. The rate is $8.00 per hour. After School Care through the parent co-op is also $8 per hour. The Scholarship fund is named to honor the memories of Lou Ingalls, Sam Leonard and Brooks Baker. In 1985, the founder of Poker Hill School, Lou Ingalls, passed away. Friends of Lou donated funds to start a scholarship fund. automobile accident at the age of 2. The following year, 10 year-old PHS alumnus Brooks Baker died after complications from a heart/lung transplant to treat his cystic fibrosis. scholarship endowment fund and for the coming year's scholarship needs. For more information about the fund, or to inquire about applying for a scholarship aid, please see Kyle Hibbard. 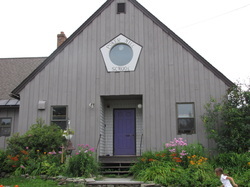 The Poker Hill School building includes floor to ceiling windows to the South and East, a library, dance room/ gym, playhouse, full kitchen, woodworking shop, greenhouse and areas for art, science, music, and dramatic play. Designed for creative play, the playground has a large sand area, tunnels, a playhouse, swings, slides, tricycles and areas for climbing and running. There is also an extensive garden, a barn and a nature trail. The emotional and social well being of each child is of prime importance to all of us at Poker Hill School. Secure and happy children can grow and flourish. Our goal is to help children separate comfortably from their parents and find school a safe and happy place to be. 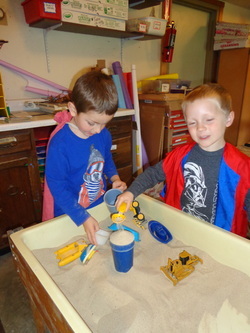 We value sociodramatic play because it stimulates children to play cooperatively together and to develop friendships. This play also allows children to express feelings, anxieties and work through emotional issues. The arts are also an integral part of the daily Poker Hill School experience. We value the process of art for its own sake, because through art the child is able to express his or her inner world of fantasies and feelings and can explore and order his or her perceptions of the world. We provide the time, space and materials for self-initiated art projects throughout the day. Our art projects, whether teacher-directed or child-initiated, are open-ended and allow each child to discover his or her own way without correction, comparison, or interruption. Music fills our days as we sing, play instruments, and dance. We believe that if we awaken the artist and the musician within each child, their lives will be incomparably enriched and fulfilled. We believe that reading and writing, just like the spoken language skills that precede them, are developmental skills that emerge according to an internal clock within each learner. Our goal is to stimulate that emergence by providing an environment rich in print and in which reading and writing are used in meaningful ways. 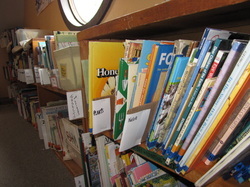 We read to the children every day, and we attempt to make books come alive through dramatizations and by using books as springboards for many other activities. Our emphasis in mathematics is on laying the experiential foundation for mathematical concepts and relationships essential for later learning. This foundation is developed through the repeated manipulation, classification, and comparison of a multitude of concrete objects. We support each child’s physical development each day, emphasizing the development of strength, flexibility, balance, and body awareness as well as the development of specific skills. We offer large motor activities and provide large motor play during free time in both the morning and the afternoon. Our outdoor environment, including the playground, driveway for trike, bike and scooter riding, gardens, fields, stream, pond and woods provide rich learning opportunities for all curriculum areas throughout the seasons. ​Teachers share responsibility for curriculum. We draw both from emergent curriculum practices as well as from The Creative Curriculum for Preschool to ensure we are developing and implementing rich curriculum for every child. At Poker Hill School, we focus on preventing discipline problems from arising. This involves setting rules, informing children of consequences, enforcing rules consistently, and redirecting problematic behavior. We encourage children to feel empathy for each other, and we emphasize the golden rule: treat others the way you would like to be treated. Teachers mediate conflict situations, looking for win/win solutions whenever possible. We encourage children to talk through problems as they arise. During large group meetings, the children help us develop other rules as needed. We aim to teach children to own their behavior and to make good choices. Children help prepare the two nutritious snacks served daily and bring their own lunches. 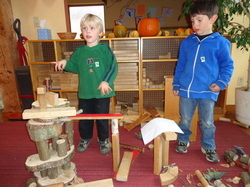 The children make their own choices regarding daily chores, activities and free play. purchased the school from Lu and Ann and continued to evolve the philosophy of child-directed learning in a farm based setting. In March 1983 a fire destroyed the original school building, a renovated 100 year old barn. The school relocated to St. Thomas Church while the school was rebuilt. After reopening in our current building in September 1983 the partnership of Steimle and the Londons was dissolved and a non-profit corporation, Poker Hill School, Inc. was established. Gay left in 1984 and Beth & David continued to run the school while The Board of Directors evolved to include parents and teachers. During the next 29 years the school continued to flourish with many dedicated staff members leaving their mark including: Bonnie MacLeod; Amy Wise; Scotte Mason; Jo McClellan; Renee Slattery; Kyle Hibbard; Abby Shaker; JoAnne Denee; Mug Tomany; John Pulio; Gayle Massingham; Thule Shartie; Pat Nugent; Rita Clark; Lisa Sweet; Heather Ward-Migner; Emily Carson; Tamara Pless; Cathy DesRoches; Tracey Leavitt; Annie Casswell; Cass Repp, Kim Kezsey and Tess Granville. 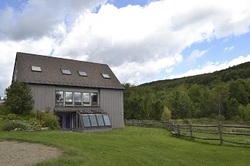 During the 2011-2012 school year, The Board of Directors launched a capital campaign to purchase the school building and grounds from Beth and David London and leadership transitioned from Beth and David to Katie Amadon. Katie had several years of experience in early childhood education and a passion for supporting children’s growth and development. Katie teamed with dedicated staff members, many who had taught at Poker Hill School for many years and who are Poker Hill School parents. In 2014, Kyle Hibbard, who has been involved in the Poker Hill School community as a teacher, parent and Board Member over the last 18 years, took over as director of the school. Kyle holds a degree in elementary education in addition to his experience at Poker Hill School. Katie is now the part-time Administrative Director. Since its inception, Poker Hill School has served more than 1200 children, and today many “second generation” students attend. The State of Vermont has recognized Poker Hill School with awards for early childhood excellence. Poker Hill School has participated in STep Ahead Recognition System (STARS), Vermont’s quality recognition system for child care, preschool, and afterschool programs. Poker Hill School has maintained a 4 out of 5 star rating each year.